Who are you? And what's this about a valley? Hi, my name is Nicole (viaticvenusaur most places), and I live in the USA. I am a graduate student doing jobs and school and stuff, but in my free time I love to do all things Pokemon-related, take walks, play video games, marathon my favorite tv shows, and stuff like that. I am also the warden who cares for this valley alongside my trusty Venusaur named Tomtom. He travels the world asking the weak, young, strong, old to join our sanctuary. There is a large number of 'Saur families living here, but there are also many of the Dedenne clans. 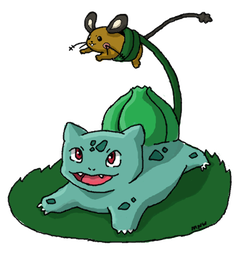 Together, these two species care for the village with a number of other species also growing in population (see "side collections"). Pokemon has been a huge part of my life since I was five years old. Almost every good childhood memory relates to Pokemon in some way. Over the past 16 years, I have accumulated Pokemon merchandise as a result of gifts, rewards, and my own purchases. 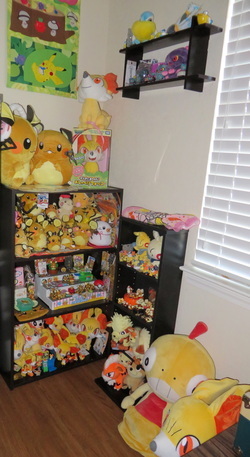 This website serves as a place to document my Pokemon collection, with primary emphasis on the certain species of Pokemon I collect and my overall plush collection. Unfortunately, I do not think I will ever have all of my merch listed on this site, but all of my main collections are pretty much up at this time! This site was created on October 3, 2012, but has had loooong lapses without update/periods of complete destruction. Why are there Pokeballs in some places? Please use the contact tab. There you'll find links to my various accounts as well as a contact form.